In a day when the very institution of marriage is crumbling, when the divorce rate is climbing to astronomical proportions, when proponents of egalitarian marriages are increasing and when countless married couples end up living alone - in the same house, the concerned couple is looking for real and practical answers. Do you want to discover the Bible's beautiful picture of Marriage and Family? Do you want to overcome, "marital drift" and experience the miracle of oneness? Do you want to bring the sparkle back into your home? Learn practical ways to build your marriage and family. Begin to experience the joyful family God intends yours to be for besides our relationship with our heavenly Father, there is nothing more important than our relationship with our family. Whether single or married, with children or not, we all have a part in God's calling to build strong spiritual families. 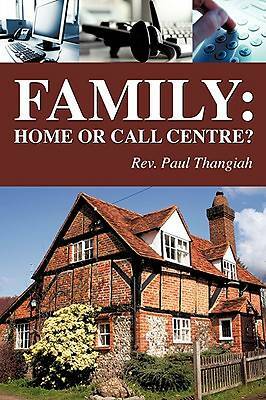 Paul Thangiah, Founder and Senior Pastor of Full Gospel Assembly of God Church in Bangalore, India is a celebrated Speaker. He has been passionately preaching the Word of God since 1976 and has been in pastoral ministry since 1982. A creative genius, he always finds very innovative ways through which he can touch broken lives and families with the transforming power of the gospel of Jesus Christ. He is an international speaker, a versatile singer, a great organizer and an able administrator. He is known globally for his Prayer Penetration Ministry, Leadership Conferences and Church Planting endeavors. His Television Program, 'This is Your Miracle' is broadcast to over million homes worldwide. A very powerful speaker, he touches many hearts with his sense of humor, simplicity and passion. His life changingmessages have made a great impact on many lives. Pastor Paul and his wife Pastor Sheba along with their children live in Bangalore, India.